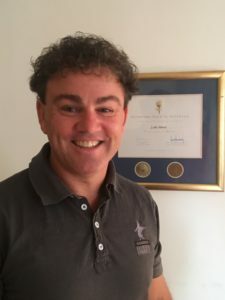 Luke Attwell has over 25 years’ experience as a qualified Myotherapist. Luke's experience and expertise assists clients who suffer chronic long term pain, sports injuries and rehabilitation. Luke was the Myotherapist for the Socceroos team since 2005. His involvement in the sport science department was an integral part of the 2018 Russian campaign. Luke was responsible for the soft tissue injury management of players and the management of injury prevention and rehabilitation. From 1991-2004, Luke worked with the Australian Rowing team and attended 1996 and 2000 Olympic Games. Between 1993-1996, Luke worked with the North Melbourne Football Club. Luke's extensive Myotherapy experience is complemented by his work in the mining, transport and civil sectors. At Iluka Resources he implemented initiatives to reduce injury rates and improve long-term health of employees. These included pre-work stretching programs, manual handling workshops/toolboxes, onsite Myotherapy consultations, rehabilitation programs, return to work program. He also helped employees improve their diet, exercise and life work balance.